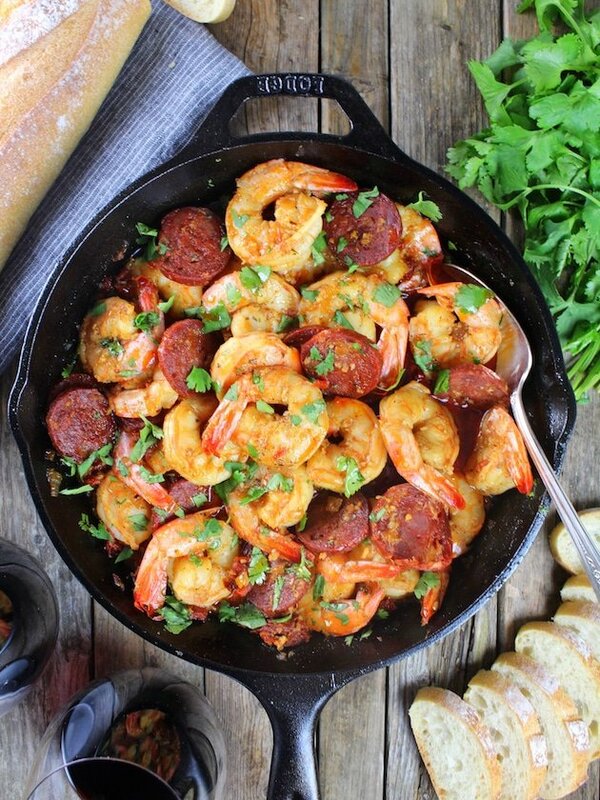 Sun-Dried Tomato Chorizo Garlic Shrimp … bursting with flavor and so much goodness! The perfect focal point for a night of appetizers, or a flavorful easy meal when served over Parmesan Polenta or angel hair pasta. I absolutely love appetizers for dinner! And why wouldn’t I?? I get to eat a few bites of lots of tasty things.? So I guess it won’t come as a surprise to know that I REALLY like to eat at tapas restaurants. It aligns perfectly with my love of eating appetizers for dinner: sampling a bunch of delicious creations all in one meal. Yum!? Appetizers, small plates, and tapas are all similar. By nature tapas are Spanish, which is even more exciting because that means I get to enjoy yummy creamy cheesy (and even meaty) croquettes, chilled gazpacho, flavorful paella, warm empanadas, manchego cheese and cured meats like jamón, salchichón and chorizo. Plus there’s always sangria, which is so perfectly refreshing on a warm summer day.? I’m making myself so hungry right now!! Why do I torture myself and write about yummy deliciousness when I’m hungry!?? I’m calling it – snack break!!! Ok, I’m back – all better. BUT I’ve learned it doesn’t have to!? 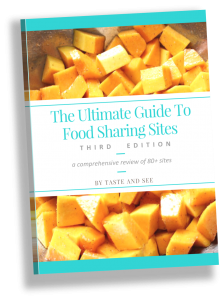 I can have this same delicious small plate sampling without breaking the bank – and so can you!? Why not make your own tapas experience or appetizer night, right in the comfort of your own home? That way you can gauge how much your budget will allow you to spend, and determine how much food to serve. 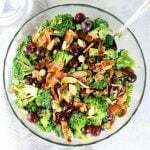 For example, you can make a big veggie platter with some delicious dips or spicy green hummus, grab a few different kinds of cheeses and cured meats, some crackers or crusty bread, a fig spread or a hot pepper jelly, add some pickles, marcona almonds, spicy olives, and dinner is served. Easy peasy and you didn’t even turn the oven on. That’s what I’m talkin’ about!!? Serving small plates doesn’t have to be expensive or too fussy. Oh no, quite the opposite. It can be as easy as chopping, slicing and staging a few of your favorite things. Some of which you probably already have in your refrigerator or pantry at this very moment. Sometimes I’ll go this no-fuss approach but add one really easy and tasty cooked item. 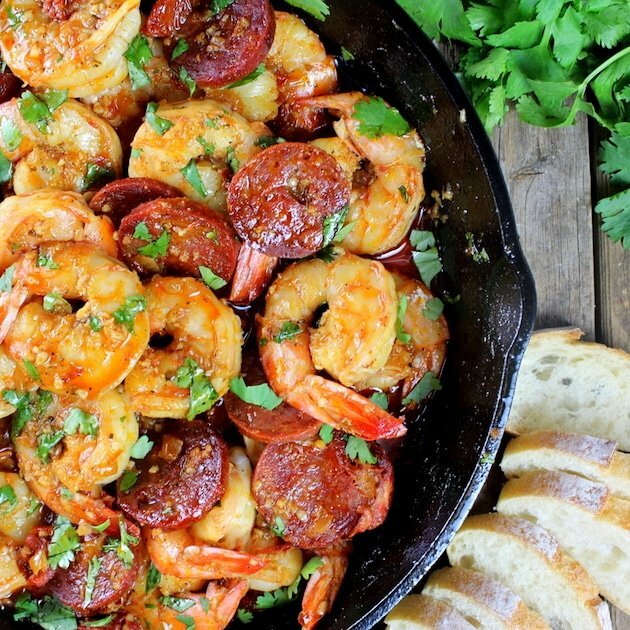 I figure everything else is so simple to put together, why not feature at least one simple hot appetizer like a Tomato Cheddar Tart OR these Sun-Dried Tomato Chorizo Garlic Shrimp!? Yes – I said Sun-Dried Tomato Chorizo Garlic Shrimp!? Truly an award winning combination: hearty and zesty and sooo delicious!? This is a really easy appetizer that’s quick to make, and has such wonderful flavor. First you slice your chorizo and cook it in a medium to high heat sauté pan for about 1 minute a side. 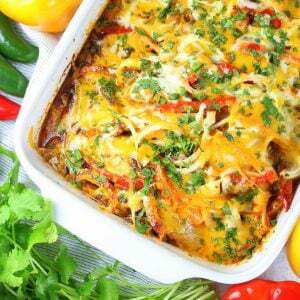 This will infuse the rest of the dish with some of the smoky zesty chorizo flavor. 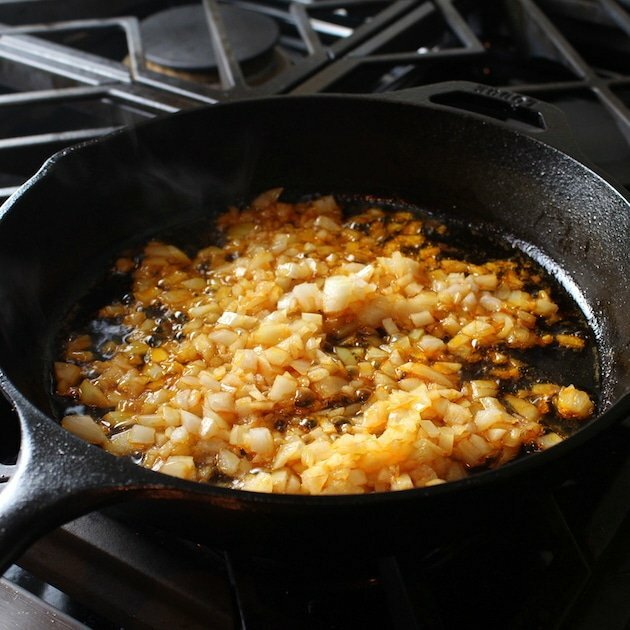 I like to use a cast iron skillet since it heats up quickly and cooks evenly. 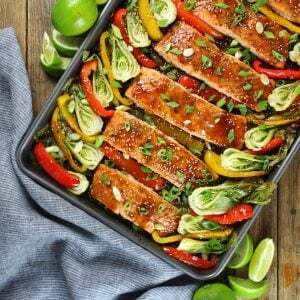 Remove the meat from the pan and set aside. 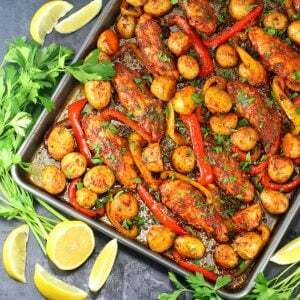 Then add your chopped onions and half a teaspoon salt and the pepper, cook for 3 minutes, add your garlic, and sun-dried tomatoes and continue to cook for one more minute. Now pour in half of your dry sherry and white wine, smoked or hot paprika, another 1/2 teaspoon of salt, and allow it to come up to a simmer. 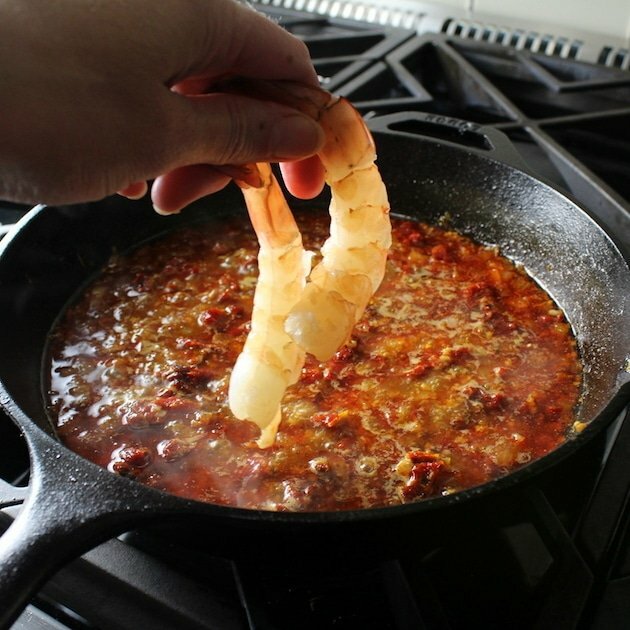 Add half of your shrimp cook for 2 minutes flip and cook for 2 more. The shrimp should be opaque/pink and curled. 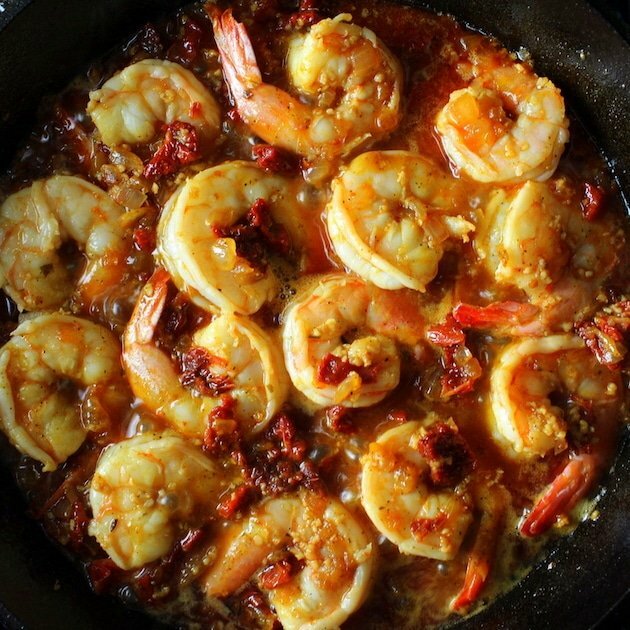 Now remove those shrimp and set aside, add the rest of the dry sherry & white wine, simmer, and repeat the steps to cook the rest of the shrimp (this process will prevent over crowding in your pan). 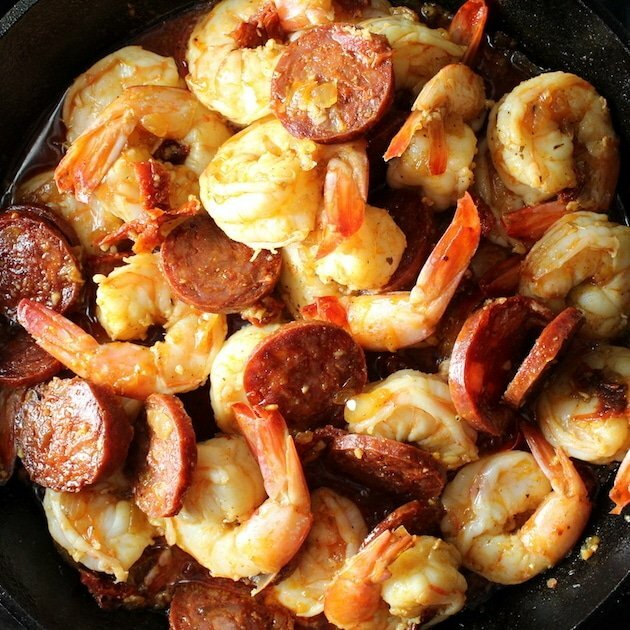 Next add in your cooked chorizo, the rest of the cooked shrimp and 2 tablespoons of butter and fold it all together. Let it cook for one more minute, garnish with chopped cilantro and serve warm. The only thing left is to pour some sangria, tear off some hunks of crusty bread and enjoy! 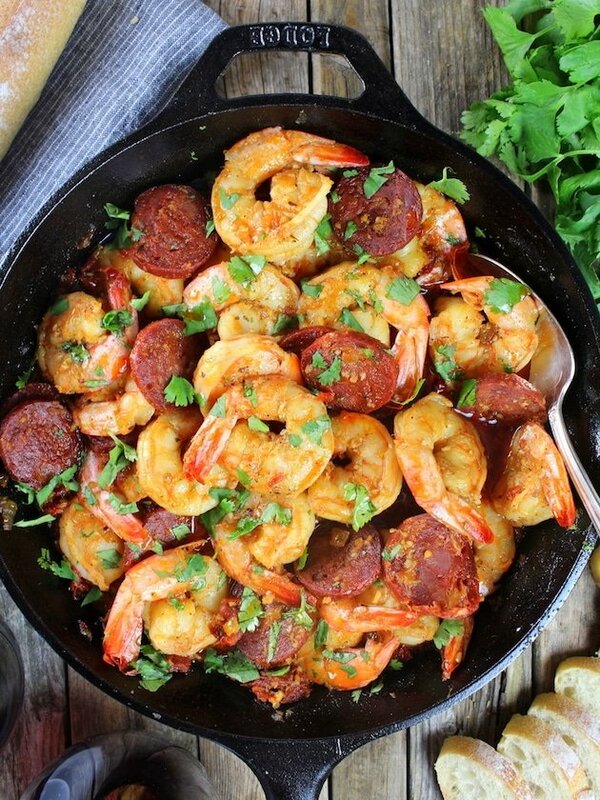 Sun-Dried Tomato Chorizo Garlic Shrimp – the perfect focal point for an easy meal of tapas or small plates that’s always delicioso! 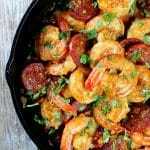 Sun-Dried Tomato Chorizo Garlic Shrimp Recipe - bursting w/flavor & goodness! 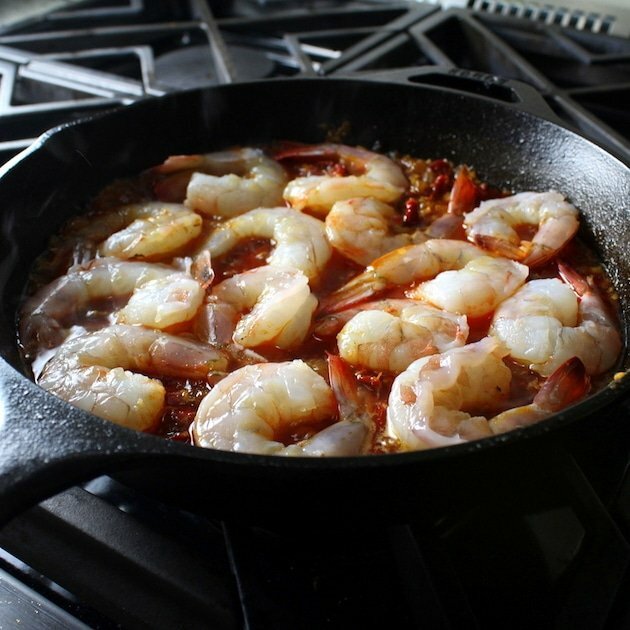 Garlic, sherry, sun-dried tomatoes, onions, butter, olive oil, fresh shrimp. 1 teaspoon smoked paprika or hot Hungarian paprika if you like it spicy! 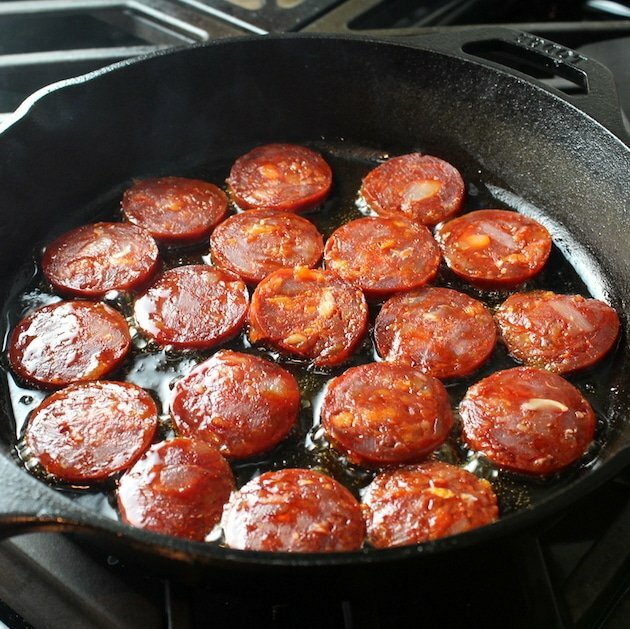 Slice chorizo and sauté over medium-high heat for about 1 minute on each side. 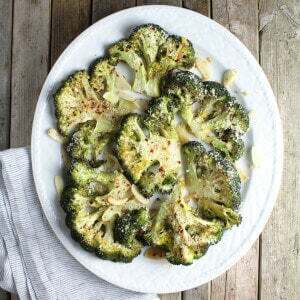 Using the same pan, add olive oil, chopped onions, and ½ teaspoon salt and pepper. 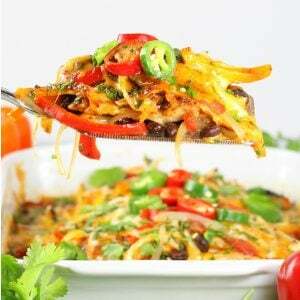 Cook for 3 minutes then add garlic and sun-dried tomatoes, and continue to cook for one more minute. Add half of the dry sherry and white wine, all the paprika, and another 1/2 teaspoon of salt. Allow the liquid to come up to a simmer, then add half the shrimp and cook for 2 minutes on each side (the shrimp should be opaque/pink and curled). Remove the shrimp and set aside. 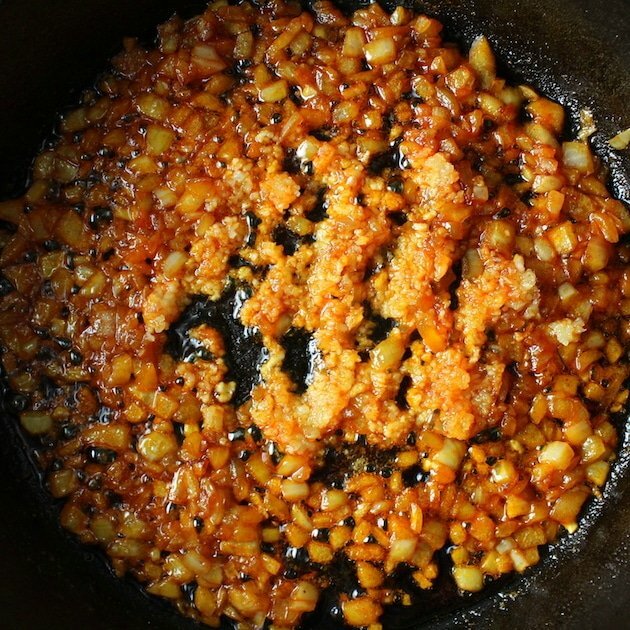 Add the rest of the dry sherry and white wine, return the liquid to a simmer, and repeat the steps to cook the remaining shrimp. The sherry can be replaced with white wine if desired.... If you go this route I recommend adding 1/2 teaspoon sugar to help balance the flavors. 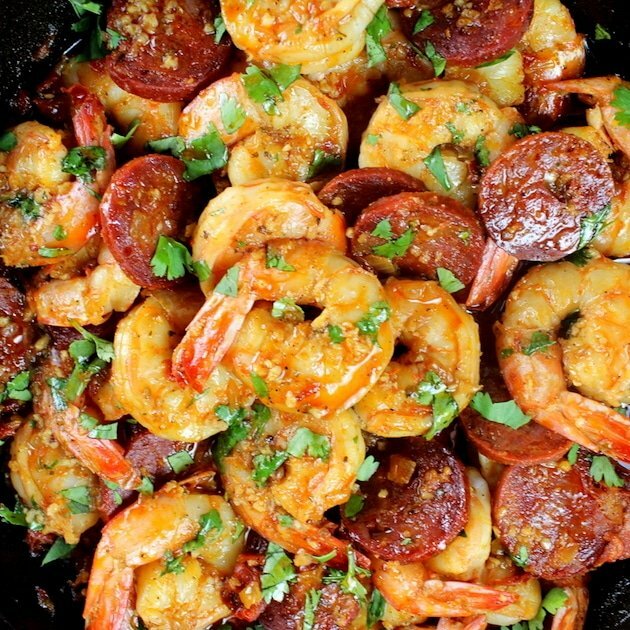 Looking for more amazing shrimp ideas? 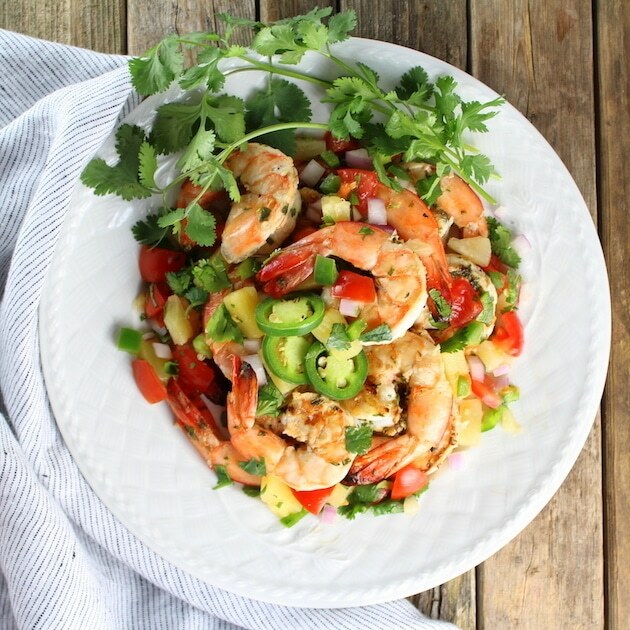 Check out these Cilantro Lime Grilled Shrimp with Pineapple Salsa! 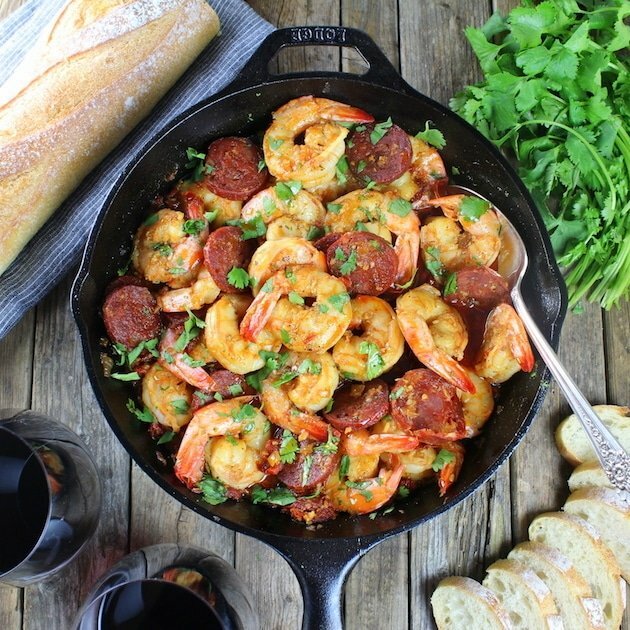 This looks like Jambalaya without the rice, celery, and okra! But seriously, I’m a sucker for each of these ingredients. Can’t wait to try this gorgeous looking dish. I don’t have any sun dried tomatoes. Wondering if there’s a DIY sun dried tomato recipe out there…..need to check. I just adore sundried tomato and any way I can eat them I will. 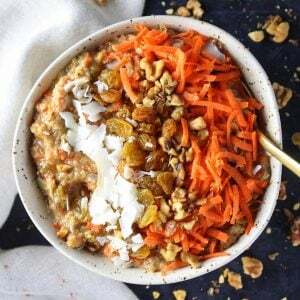 This looks delicious too! 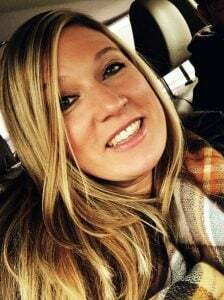 Hi Danni, Thanks so much! 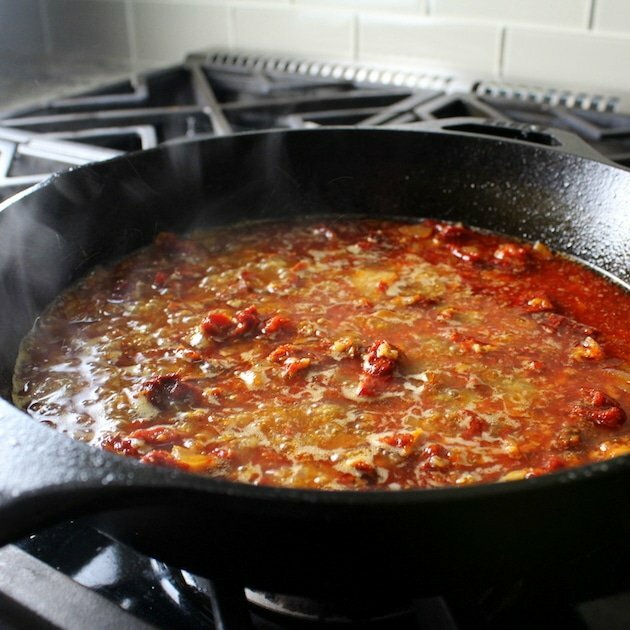 I love the intense flavor that sun-dried tomatoes have – they add great seasoning to any dish! 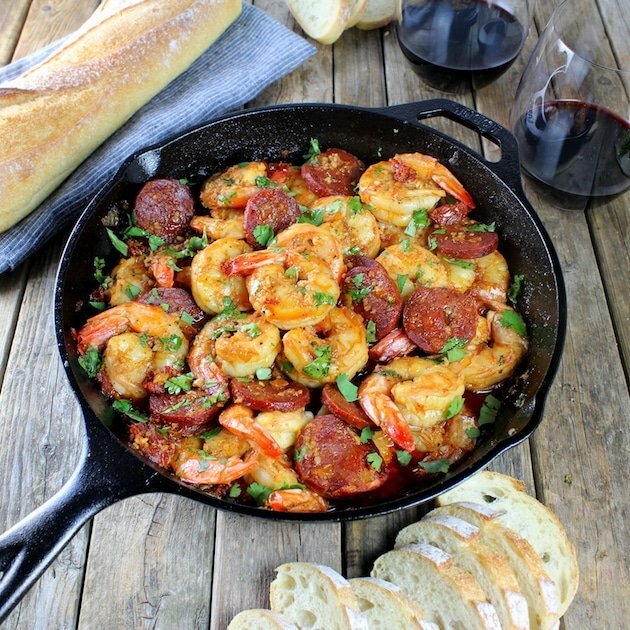 Especially this one – I can’t get enough of this chorizo sun-dried tomato garlic shrimp combo! I am with you on the appetizers for dinner! I too love to get my fill of multiple different tastes that apps bring to the table! Beautiful pictures, as well! Thanks Amanda! What can we say? Like minds!!? I guess the main reason I love it so much is because I can eat 5 of my favorite things all in one meal! YUM! Hi Sarah! 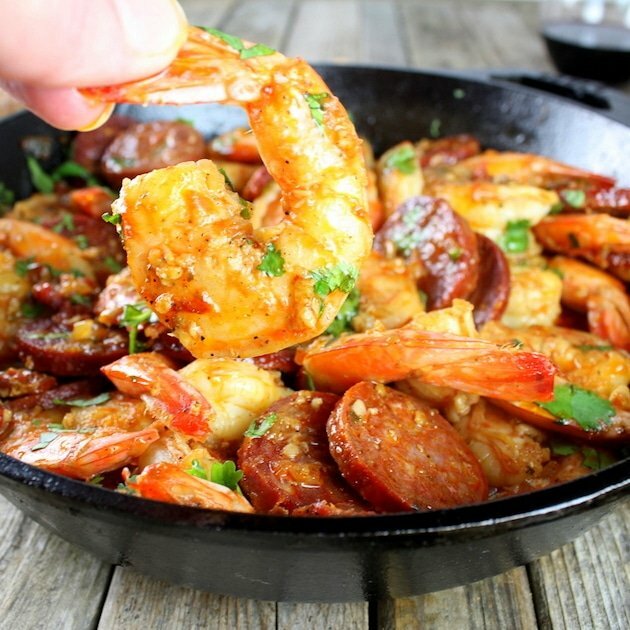 Shrimp does make for a delicious and quick meal. 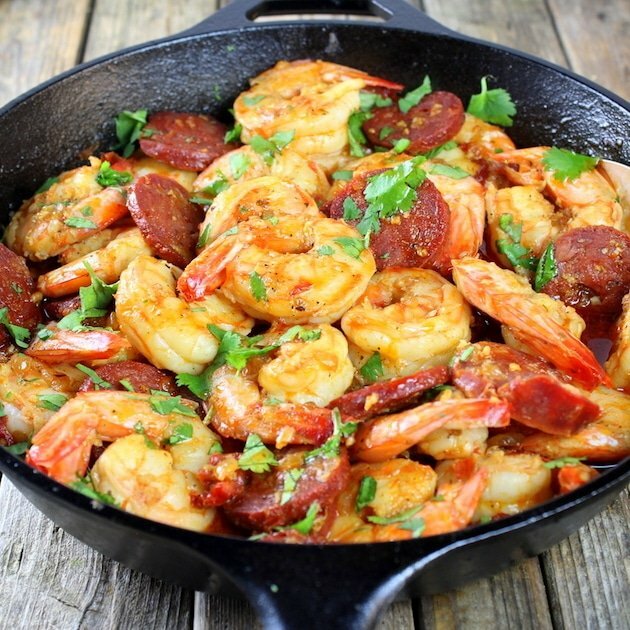 And I too love the the sun-dried tomato shrimp combo – it’s super tasty! 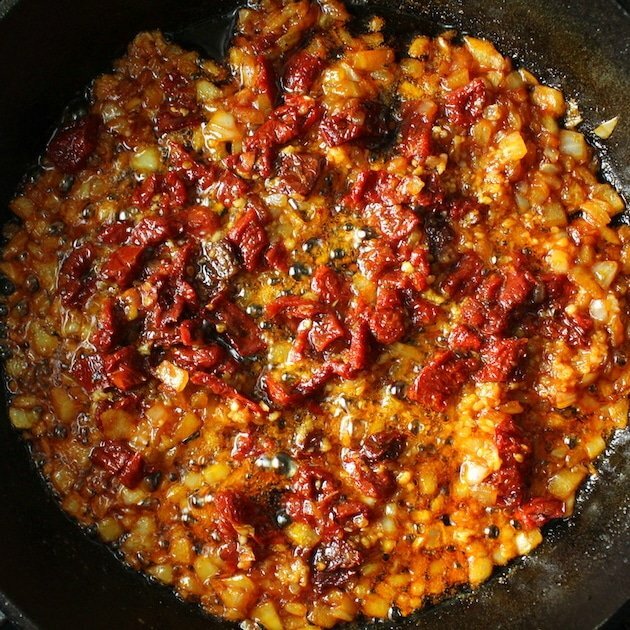 Sundried tomatoes and garlic are two of my favorite flavors! Have you ever tried roasting garlic in tinfoil with the sundrieds? SO good! Great flavor combo you have here! Thank you Sophia! I’ve only roasted garlic by itself and it’s amazing. I adore sun-dried tomatoes so I’m sure I would love the two together. Thanks so much for the tip! Hi Becca, I think it ends up being more expensive than a regular dinner out. I love a good tapas night at home with friends. It’s so relaxed and we all contribute something to the meal. 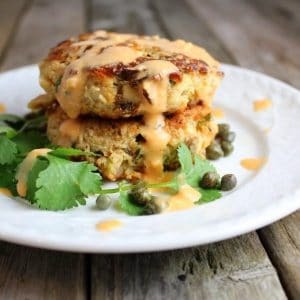 So easy and always delicious! Thanks AZ!! Me too! It’s insanely tasty! !